My friend Teri makes makes exquisite one-of-a-kind jewelry from carefully curated beads and gems. Her jewelry is as much of a joy to behold as it is to wear. Her husband Paul is just as gifted with his hands. I didn't quite get it when he desribed his pottery as functional until I held his work in my hands. It sits well, it feels right and I know exactly what I am going to use it for. Joseph O'Leary brought his canvases of landscape photography and collection of hearts in nature. Lisa Sharpe of Stylish Sparrow had vintage dresses as well as sustainable and planet-friendly fashion accessories. Mallory of Mayflower Organics had a wonderfully aromatic selection of handmade bar and liquid soap made with all certified organic vegetable and essential oils. Rebecca brought her paintings and delightful cards based on her paintings. Thank you to everyone who came out last weekend! 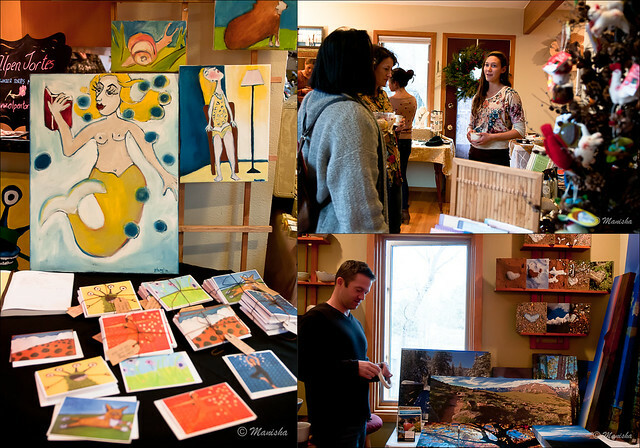 It was an amazing experience and I know I speak for all of us when I say that we are very grateful that you supported local Boulder artists through your Holiday shopping. Will I do it again? Absolutely, yes! 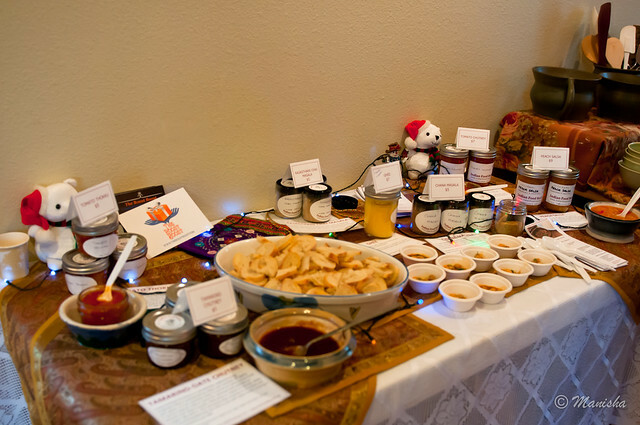 While I explore food licensing and being able to share my products with an audience wider than my local friends and their friends, give me a holler through this order form if you would like to try any of my current offerings. Suggested donations for each item are listed and shipping will be additional (USPS Priority and within continental USA only). I have been away but I have been busy and hope to get busier come 2015! While it is good to be busy, I feel like I have forgotten how to write. Writing has always been a cathartic exercise for me, in a positive way. But now, I shy away from writing lengthy prose just as I procrastinate processing my pictures. For just as quick status updates and mini sentences have replaced lengthier posts, my phone camera has effectively taken the place of my beloved heavy DSLR and, boom! Instagram is easier to use than Flickr. Instant gratification seems to win each time. It's a little like this recipe. Sabudana khichadi is one of my favorite dishes. Traditionally made from sabudana or sago, it is eaten during days of fasts. You read that right! There is a whole set of fasting recipes, dishes made when people "fast". I view fasts as more of abstinence from meat and certain types of foods. Most cooked foods for fasts are carb-heavy, and one such example is sabudana khichadi. My family did not fast. My mother used to tell us that my father would need to entertain at the drop of a hat and it posed a problem if she was fasting. Part of fasting rituals included not handling certain foods, especially meat. But that didn't mean that she did not cook any of the fasting recipes. It's been hit or miss with sabudana here in the US. Sometimes, the pearls are perfect; other times, they are a soggy mess. ET's khichadi using couscous has always been at the top of my list to try but for some reason, I never bought couscous, Israeli or otherwise. Until we spent part of our summer in California in 2011. While there, Trader Joe's was my nearest grocery store and I chanced upon their Harvest Blend and have not looked back since. It's a lot easier now that we have a Trader Joe's in Boulder; otherwise I had to rely on friends to bring me packets when they visited. 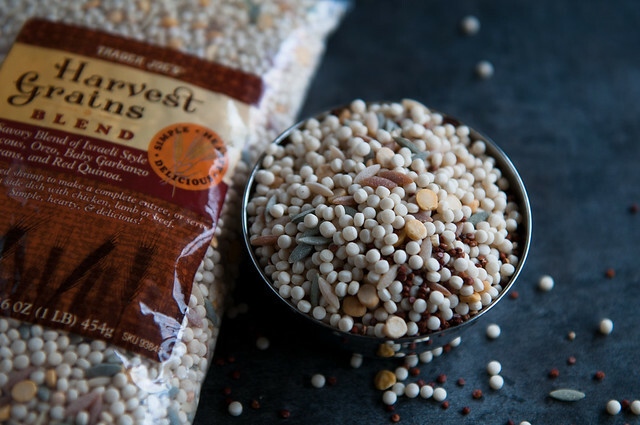 This Harvest Blend contains Israeli couscous, orzo, baby garbanzo beans and red quinoa. It is far more nutritional than starchy sago and it also cooks quicker — in 10 minutes — with no pre-soaking required. Instant gratification. On a weeknight, this is a blessing! Peanuts are a must in this khichadi. 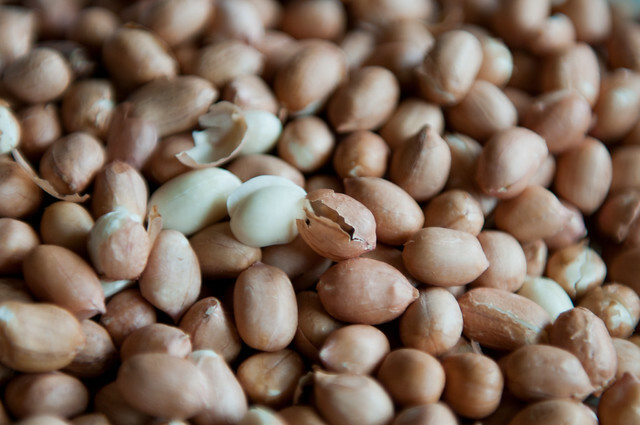 I have said this before but it begs repeating: buy raw peanuts from the Indian grocery store and roast them yourself. They taste much better than store-bought roasted peanuts. Try it at least once. Peanuts can be roasted on a warm griddle or tava, or you can do what I do: lay them in a single layer on a microwave-proof plate, heat on high for 1 minute, allow to cool for about a minute and heat on high again for another minute. Cool completely before handling or eating. Sheer laziness prevents me from crushing peanuts to an even size. I put them in a ziploc to contain them and then pound them using a mortar-pestle. I actually prefer the texture of unevenly crushed peanuts. While I refuse to have anything to do with dried kadipatta and even less with frozen kadipatta, I will and do freeze hot green chiles. 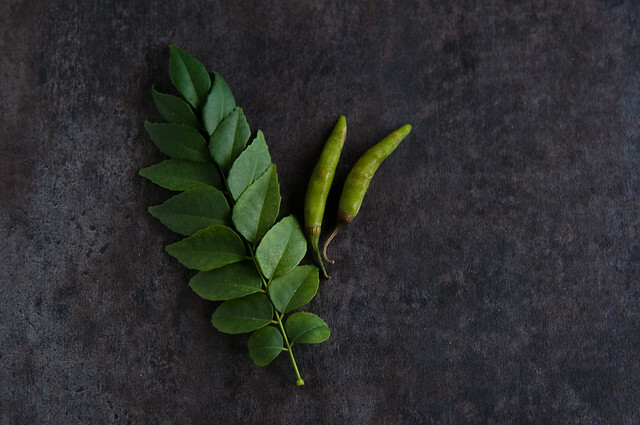 Kadipatta loses its flavor when dried and becomes a discolored mess when frozen. Several Asian markets in the area are known to sell frozen kadipatta. Walk away, my friends, do not waste your money on limp flavorless leaves. There is no substitute for kadipatta. Green chiles, on the other hand, do not lose their flavor when frozen. Come winter and it's a must to have a stash in the freezer. I don't bother to de-stem them as any bacteria that sits there will freeze with the rest of the chile in the freezer. Like peanuts, potatoes are a must in this recipe. Since we are all fans of the spud, I count one medium red potato per person. Peeled and diced small, they cook quickly in the khamang phodni. Many cooks use boiled potatoes but I love the flavor of potatoes cooked in ghee. A good phodni makes or breaks this dish, as with most Indian dishes. Hot ghee, dancing cumin seeds, kadipatta, and finely sliced green chiles are all you need. Diced potatoes cooked in this seasoned oil must be a more than a little spicy. 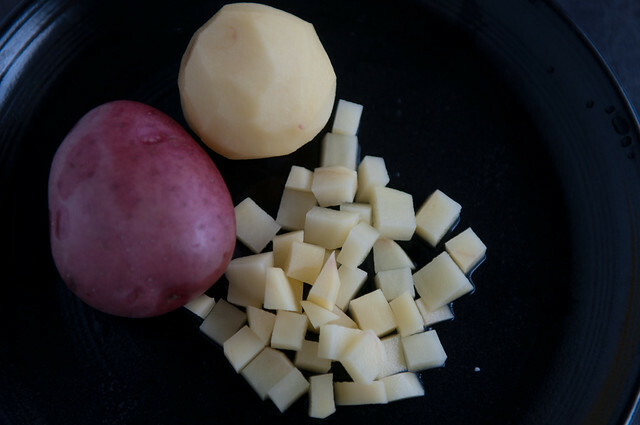 Cook the Harvest Blend according to the instructions on the packet and fold them into the potato and peanut mixture. Season with salt and finish off with a generous squeeze of lemon juice. The presence of things not quite pearly isn't at all alarming and this is the best way to get a shot of sabudana khichadi without a heavy dose of carbs, and not feel guilty about adding more carbs by way of potatoes. Heat 2 tbsp ghee in a saucepan and when it shimmers, add cumin seeds. Turn the heat down so that the cumin seeds do not burn. Quickly add kadipatta and green chiles. Add diced potatoes and stir to coat the potatoes with the now spicy seasoned oil. Season lightly with salt, and cook on medium, stirring occasionally, until potatoes are somewhat crispy and cooked through. Add crushed peanuts and stir. Slowly fold in the cooked Harvest Blend in 3-4 batches, seasoning with salt and adding some lemon juice after each batch is transferred to the saucepan. Add 1 tbsp ghee and stir to mix. Adjust seasonings. Serve hot and enjoy right away! Use Israeli couscous if you do not have a TJ's nearby. Some cooks garnish with coconut and cilantro. I don't. If the heat of the green chiles is somewhat diminished because of the Harvest blend, add some red chile powder to up the heat. I always taste the potatoes when done and if they are super spicy, then I know that the final result will be what I want. Sabudana khichadi is a favorite for breakfast on weekends. Or a quick meal on weeknights. Or sometimes, as a snack with tea. 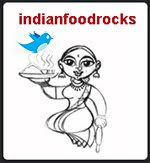 OMG, Manisha, seeing your pics of food reminds me of just how much I have missed checking your blog. You inspire me, and your recipes always work. My fault, my fault...I've had a fling with Japanese cuisine behind your back. ;) But I'm back to my first love. We're having curried duck for Christmas Eve dinner! Anna, I hope your Christmas Eve dinner was delicious and satisfying! I'm just so glad that you are still here and reading, even though I have been having my own little fling with microblogging sites. I'm happy to forget your little fling, if you are willing to forget mine! I'm very sure that you won't get Harvest Blend in Spain but Israeli couscous should not be as difficult to find, right? Erika, you never cease to amaze me! 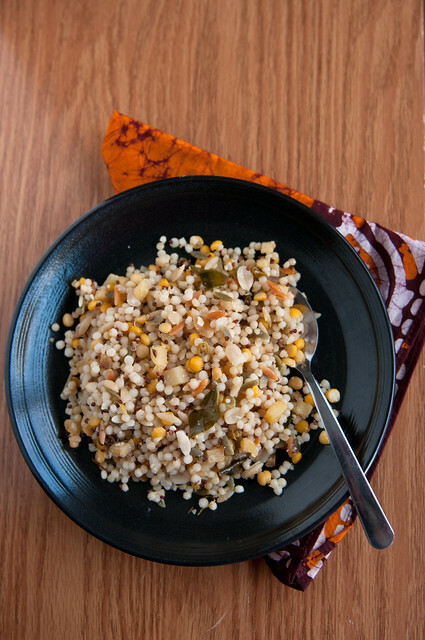 If you want the same texture and taste as sabudana, then stick with Israeli couscous. If you want less carbs, go with TJ's Harvest Blend. I love it!